PC gamers looking to upgrade their setup can put together a nice little package today at Amazon. 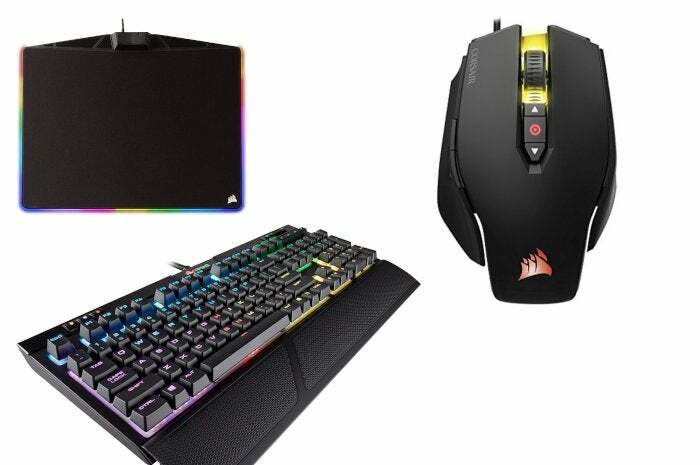 The online retailer has a trio of great deals on Corsair gaming devices, and you can grab a keyboard, mouse, and mousepad (all with RGB lighting of course) for less than $170. First up is the Corsair Strafe RGB MK.2 mechanical keyboardRemove non-product link with Cherry MX Red switches for $100–down from a retail price of $140. We haven’t done an official review of this keyboard, but it does get honorable mention in the best budget keyboard category in our round-up of the best gaming keyboards. The Strafe MK.2 features USB passthrough, the ‘quiet’ version of the Cherry MX Red switches, onboard profile storage, and per-key RGB backlighting. You can pair the Strafe MK.2 with the Corsair M65 Pro RGB gaming mouse for $30Remove non-product link. This mouse has an MSRP of $60 and usually sells for $40 on Amazon. It has a 12,000 DPI optical sensor, aluminum chassis, tunable weights, and an adjustable DPI sniper button. Rounding out the package is the Corsair MM800C Polaris RGB mouse pad for $38Remove non-product link, which has a $60 MSRP. This mouse pad has 15 customizable RGB LED zones, USB passthrough, and a cloth surface. The MM800C is also compatible with Corsair’s CUE Link software in order to synchronize the RGB lighting with other devices such as the M65 Pro RGB and the Strafe MK.2.